Plymouth, MI. – February 4, 2016 - Take to the campaign trail today with Stardock's The Political Machine 2016. Give speeches, go on talk shows, hire unsavory operatives, and do whatever it takes to win the presidency in this popular political strategy game. 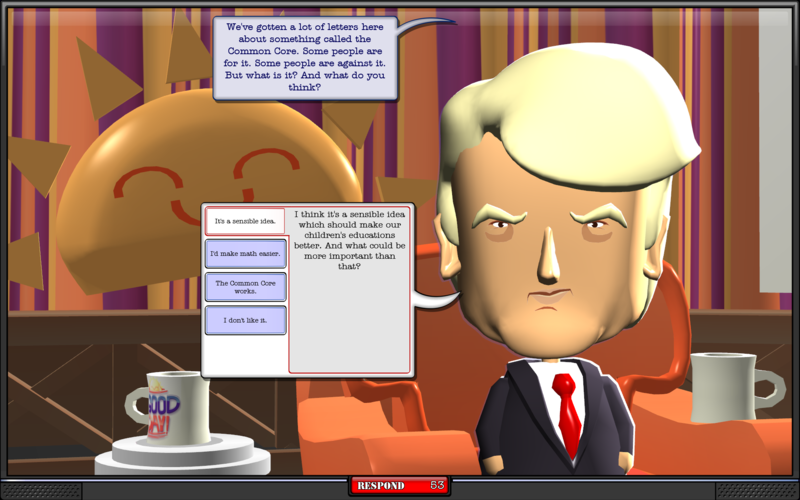 The Political Machine 2016 offers the player a choice to play as one of over a dozen candidates such as Donald Trump, Bernie Sanders, Hillary Clinton, and more. The player can also choose to create their own custom candidate, complete with their own unique avatar, political party, and hometown. "The game deals with topics like the Keystone XL Pipeline, human trafficking, and other issues that are current and relevant to this year’s election", said producer Patrick Shaw. "We’ve added a poll tracking feature so that you can see how your own political races are matching up to what’s going on in the United States right now." The game also features opportunities for the candidates to interview on various talk shows to raise their ratings in the polls. Torrid affairs, natural disasters, email scandals, and other random events keep players on their toes and ready to deal with unexpected problems. By purchasing advertisements that appeal to the issues of each individual state, and hiring operatives to bring down your opponent or make you look good, players will find many different strategies for how to take down their opposition and become the President of the United States. The Political Machine 2016 is now available on Steam for $9.99 at http://store.steampowered.com/app/404620. Visit www.politicalmachine.com for more information. About Stardock: Stardock is a developer and publisher of PC games and desktop software founded in 1991 by nationally recognized technology expert Brad Wardell. Located in Plymouth, Michigan, Stardock is a powerful leader in the video gaming and software development world. Its PC games include Sins of a Solar Empire, the critically acclaimed Galactic Civilizations series, and the highly anticipated upcoming Ashes of the Singularity. Stardock puts the user experience first through software that enriches the Windows experience for everyone from casual computer users to highly technical professionals. Products offered by Stardock include Start8, Start10, Fences, WindowBlinds, Multiplicity, and more at www.stardock.com.